Most hyperthyroid cats are clinically stable when referred for radioiodine therapy. And the radioiodine therapy itself is amazingly non-stressful. 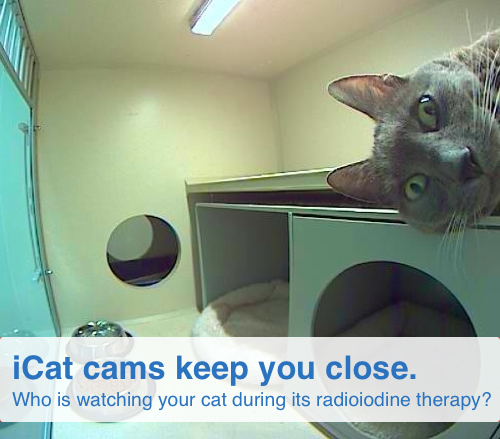 As a result, most hyperthyroid cats undergoing radioiodine therapy do not require continuous 24×7 monitoring. The variety of conditions that sometimes occur concurrently in hyperthyroid cats, especially thyroid induced cardiovascular disease, do result in individual cases that warrant a more aggressive monitoring schedule than is usually available for cats undergoing radioiodine therapy. However, the very nature of the isolation required of patients receiving radioiodine therapy makes direct persistent supervision of the patient impossible. Veterinarians and technicians in constant contact with radioactive patients day after day, week after week, year after year, would themselves receive potentially excessive levels of radiation exposure, limiting their ability to perform these duties over time.